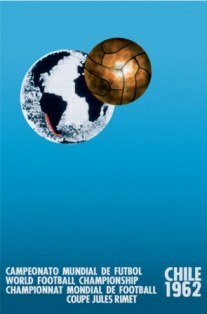 The 1962 FIFA World Cup Final was the deciding match of the 1962 FIFA World Cup. The match was held at the Estadio Nacional in Santiago, and was contested by Czechoslovakia and Brazil. Brazil won the game 3–1 to record their second consecutive World Cup victory. Both teams had played each other during the group stage which ended in a goalless draw. This was the second World Cup final match featuring teams who had already competed against each other during the group stage (the first was the 1954 final between Hungary and West Germany). This was only the second successful defence of the World Cup title in the history of the competition (after Italy in 1938) in spite of the absence of one of the Brazil's star players of 1958, Pelé. A total of 56 teams entered the 1962 FIFA World Cup qualification rounds, competing for a total of 16 spots in the final tournament. Chile, as the hosts, and Brazil, as the defending champions, qualified automatically, leaving 14 spots open for competition. As with previous World Cups, the rules of the qualification rounds were quite confusing. Moreover, the winners of the four weakest continental zones: North America (NAFC), Central America and Caribbean (CCCF), Africa (CAF) and Asia (AFC), were not guaranteed direct spots in the final tournament. Instead, each of them had to enter a play-off against a team from either Europe (UEFA) or South America (CONMEBOL), with the winners of the three play-offs qualifying. Europe (UEFA): 8 direct places + 2 spots in the Intercontinental Play-offs (against teams from CAF and AFC), contested by 30 teams (including Israel and Ethiopia). South America (CONMEBOL): 5 direct places + 1 spot in the Intercontinental Play-offs (against a team from CCCF/NAFC); 2 direct places went to automatic qualifiers Chile and Brazil, while the other 3.5 places were contested by 7 teams. North, Central America and Caribbean (CCCF/NAFC): 1 spot in the Intercontinental Play-offs (against a team from CONMEBOL), contested by 8 teams. Africa (CAF): 1 spot in the Intercontinental Play-offs (against a team from UEFA), contested by 6 teams. Asia (AFC): 1 spot in the Intercontinental Play-offs (against a team from UEFA), contested by 3 teams.A total of 49 teams played at least one qualifying match. A total of 92 qualifying matches were played, and 325 goals were scored (an average of 3.53 per match). The three teams in this group played against each other on a home-and-away basis. The group winner qualified for the seventh FIFA World Cup held in Chile. Antônio Wilson Vieira Honório (11 June 1943 – 11 March 2019), nicknamed Coutinho, was a Brazilian coach and footballer who played as a forward for Santos Futebol Clube, where he was a teammate and one of the best partners of Pelé, and became a member of the Brazilian national team that won the 1962 FIFA World Cup. Coutinho is Santos' third all-time top goalscorer. The Battle of Santiago (Italian: Battaglia di Santiago, Spanish: Batalla de Santiago) was a football match during the 1962 FIFA World Cup, played between host Chile and Italy on 2 June 1962 in Santiago. It gained its nickname from the level of violence seen in the game, in which two players were sent off, numerous punches were thrown and police intervention was required four times. The referee was Ken Aston, who later went on to invent yellow and red cards. 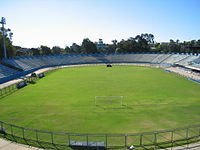 Estadio Sausalito (Spanish pronunciation: [sausaˈlito]; Sausalito Stadium) is a multi-purpose stadium in Viña del Mar, Chile. 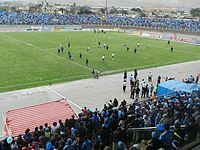 It is currently used mostly for football matches and is the home ground of CD Everton. The stadium holds 22,360 people, was built in 1929 and completely renovated in 2015. The stadium has hosted the 1962 World Cup, two times the Copa América (1991 and 2015) and a FIFA U-17 World Cup. The name comes from the nearby Sausalito lagoon. Ferenc Sipos (13 December 1932 – 17 March 1997) was a Hungarian footballer and trainer. During his club career he played for MTK Hungária FC and Budapest Honvéd FC. He earned 77 caps and scored 1 goal for the Hungary national football team from 1957 to 1966, and participated in the 1958 FIFA World Cup, the 1962 FIFA World Cup, the 1964 European Nations' Cup, and the 1966 FIFA World Cup. Georgi Pachedzhiev (Bulgarian: Γеорги Пачеджиев; 1 March 1916 – 12 April 2005) was a Bulgarian football manager who coached Bulgaria at the 1962 FIFA World Cup. As a player, he played for AS 23 Sofia, and was the top scorer in the Bulgarian A Professional Football Group in 1939 with fourteen goals. He died in April 2005. Giacomo Losi (Italian pronunciation: [ˈdʒaːkomo ˈlɔːzi]; born 10 September 1935) is an Italian former football manager and player, who played as a defender. He spent his entire professional career, from 1955 to 1969, with Italian club A.S. Roma. Most of his family now resides in Boston, Massachusetts USA, with his nephew Michael J. Losi a budding USA Men's National Team Star. Though he was not a native of Rome, during the 15 seasons he played in the capital city, he was nicknamed "Core de Roma" (Romanesco for Heart of Rome). In total he made 450 appearances with the giallorossi, a record which lasted for 38 years, until 31 January 2007, when Francesco Totti played his 451st match for the club.At international level, he represented the Italy national football team at the 1962 FIFA World Cup. Honorino Landa Vera (1 June 1942, in Puerto Natales – 30 May 1987, in Santiago) was a Chilean footballer who played as a midfielder. Humberto Dionisio Maschio (Italian pronunciation: [ˈmaskjo]; born 20 February 1933 in Avellaneda, Buenos Aires Province) is an Italian Argentine former football player and manager, who played as a forward. During the late 1950s and 1960s Antonio Valentín Angelillo, Omar Sívori and Maschio acquired the nickname The Angels with Dirty Faces when they moved en masse from Argentina to play football in Italy. The name, an ironic reference to the then-celebrated Angels with Dirty Faces movie, was given to them on account of their typically South American colour and flair. They were also known as The Trio of Death because of their clinical ability in scoring goals. At international level, he represented both the Argentina national football team, winning the 1957 Copa América, and the Italy national football team, taking part in the 1962 FIFA World Cup. Josef Masopust (9 February 1931 – 29 June 2015) was a Czech football player and coach. He played as midfielder and was a key player for Czechoslovakia, helping them reach the 1962 FIFA World Cup Final. He was capped 63 times, scoring 10 goals for his country.He was named European Footballer of the Year in 1962. In November 2003, to celebrate UEFA's Jubilee, Masopust was selected as his country's Golden Player by the Football Association of the Czech Republic as their most outstanding player of the past 50 years. He was named by Pelé as one of the top 125 greatest living footballers in March 2004. János Göröcs (born 8 May 1939, Gánt) was a Hungarian footballer. He played for the club Újpesti Dózsa as a striker and a midfielder, and later for Tatabányai Bányász. He played 62 games and scored 19 goals for the Hungary national football team. He was best-known for his participation in the bronze medal winning Hungarian team on the 1960 Summer Olympic Games and for playing on the 1962 FIFA World Cup. He later became trainer of Újpest. László Sárosi (27 February 1932 – 2 April 2016) was a Hungarian footballer and coach.During his club career he played for Vasas SC. He earned 46 caps for the Hungary national football team from 1957 to 1965, and participated in the 1958 FIFA World Cup, 1962 FIFA World Cup, and the 1964 European Nations' Cup. Vladimír Kos (31 March 1936 – 17 September 2017) was a former Czech football player. During his club career he played for ČKD Praha. He was part of the second-placed team at the 1962 FIFA World Cup, but did not win any caps for Czechoslovakia.